This has been sent to me by a friend. It's worth watching. A You Tube video of a protester in Ukraine has been viewed 3.5 million times - are we seeing the rise of the viral video protest? In the three months since the start of the Ukraine crisis, there have been countless videos uploaded to Please Use ViewPure. But none has had anything like the impact of a video called "I am a Ukrainian". In it, a young protester stands on the street in Kiev on a cold dark night. She addresses the camera directly and simply. "We want to be free," she says - in English. The courts are corrupt, she says, and politicians are behaving like dictators. Stunning photos and video, James. This is from Greek Catholics in Ukraine. In another story on this web site they mention Franciscans out on the Maidan. A group of protesters, who were escaping from the Berkut, hid behind the walls of the Roman Catholic St. Alexander’s Cathedral and the priests closed doors to the security forces who tried to break into the church. Berkut and internal troops came close to the barricades on the Maidan. Maidan activists called on all to pray. A lot of women and children are on the Maidan, and are being evacuated. The churches are ringing their bell, prayers are heard from the main stage on the Maidan. During the offensive by the security forces from Instytutska Street, they set on fire the interreligious chapel, which had been in operation near the Maidan. Later, it completely burned down. Espreso TV is reporting that Deputy Chief of the General Staff of the Armed Forces of Ukraine, Lieutenant-General Yuri Dumansky has resigned. They also reported that leaders of military units in various areas also went over to the people's side. Myroslav, who is the Vice Rector of the Ukrainian Catholic Uni in Lviv, is actually one of my relatives and spent time in a concentration camp. He is a good man. From the Vice-Rector of the Ukrainian Catholic University in Lviv, Ukraine. What can Ukraine expect from the West now? Instead, listen to Ukrainian media sacrificing their journalists’ lives to get truthful information. Do not rely so much upon the information provided by your special correspondents in other countries who come to Ukraine for a day or two. Hire Ukrainians who live in this country to translate the Ukrainian cry of pain. Secure money for that right now instead of waiting for funds from next year’s budget. The three months of protests in Ukraine that ended with government snipers killing dozens of people has strengthened the commitment to democracy of many Ukrainians, but also left the country vulnerable to further violence and division, said the head of the Ukrainian Catholic Church. “The danger that our neighbor (Russia) will provoke a civil war has not passed,” Archbishop Sviatoslav Shevchuk of Kiev-Halych told reporters in Rome today, adding that the protests have solidified the Ukrainian people’s commitment to independence, freedom and democracy. Ukraine has put its military on highest alert, with the defence ministry calling up army reservists, after Russian president Vladimir Putin declared he had the right to invade the country. On Sunday, they surrounded several small Ukrainian military outposts and demanded the Ukrainian troops disarm. Some refused, leading to standoffs, although no shots were fired. The Australian government has summoned the Russian ambassador to explain his country's actions in Ukraine. Foreign Minister Julie Bishop said the secretary of her department, Peter Varghese, will meet with Ambassador Vladimir Morozov on Monday. Ms Bishop told Australian Broadcasting Corp. radio: "We'll express our concerns officially, directly through him and also seek to ascertain exactly what the Russian government thinks it's doing." Pope Francis asked for prayers for Ukraine on Sunday, which he said was living through a delicate situation. ... first and foremost we are urging all of you and all people of goodwill to unite with us in a prayer for Ukraine and the Ukrainian people. We appeal to the Russian authorities to come to their senses and stop the aggression against Ukraine, immediately withdrawing its troops from Ukrainian land. The Russian authorities shall bear full responsibility before God and humanity for the irreparable consequences of further escalation of violence. In our country there is no harassment based on language, nation, or religion. Therefore, we attest, all attempts made by Russian propaganda to represent the events in Ukraine as a “fascist coup” and “extremists’ victory” do not correspond to reality. This is so sad. Right now I feel especially fearful for the young Ukrainian men trapped inside bases and surrounded by Russian military. They don't have a chance of surviving a fight. Grace wrote: This is so sad. Right now I feel especially fearful for the young Ukrainian men trapped inside bases and surrounded by Russian military. They don't have a chance of surviving a fight. I find it somewhat odd the base in Crimea wasn’t at a state of readiness. At the current time it's safe to say this is pure Putin bullying and hopefully this doesn’t escalate. I would think Putin would find it to his advantage to avoid bloodshed against outnumbered Ukrainian soldiers – and let them leave peacefully for parts West in the days to come. At this point of time Crimea region has been adopted under the “Russian Flag” -- supposedly under pretense of protection. The picture of this incident in Crimea that stands out the most to me is one where an invading force has their backs turned to an armed soldier protecting his ground? I posted a lament on some social media sites that it is extrmemely difficult to figure out who's right and who's wrong in this situation. In part, it was inspired by the fact that on one social media site, Google Plus, I was hearing from people who seemed informed and educated and wise that Putin is a clear aggressor here, and the Ukranians are freedom-loving people who just want to be left alone to connect with whichever group they want to. On Facebook, our own Father Angel Sotelo was saying that the Ukrainian protesters just kicked out the legitimate government in a coup and the new regime is composed in part of racists and fascists who want to oppress ethnic Russians in a play for cultural and ethnic purity. A friend of mine, privately, told me that the concern of ethnic Russians in Crimea is legitimate, that white supremacy is alive and well in Ukraine, and both regimes are full of bad people. I don't know what to think. I do know that I'm not in a position to evaluate them both. So I pray for peace and let God sort it out. Jeff, the parties at play here in that region of the world seem to subscribe to a quote attributed to Winston Churchill, "In wartime, truth is so precious that she should always be attended by a bodyguard of lies." Here was my lament. Don't think the complaint in the middle is aimed at any of you. This is a problem for us observers. To be clear, obviously I'm well aware that it's an utter nightmare for those in Ukraine. I'm just talking about a difficulty we have here in the very safe, not-been-touched-by-war-in-150-years, United States of America. #firstworldproblems yadda yadda yadda yeah I know. A friend of mine, a good priest, on Facebook, sounds very confident and well-informed about the Ukraine situation. His evaluation of the situation is 100% different from friends of mine on Google Plus who sound equally confident and well-informed about the Ukraine situation. I cannot take a dozen hours out of my life to read primary source material translated from a language I have no familiarity with to dig into the truth of the matter. To figure out who I should support and what my opinion should be. I have a life to live and a family to take care of and appreciate. And yet, when I read these commentators I respect and like, I feel as if I am obligated, as a decently informed person and voter, to make a decision. That I should support one or the other. I am further frustrated when people who I suspect have taken no more time or effort to understand this situation than I have, and likely significantly less, post memes and political cartoons and links to articles from biased sources as if they understand the situation and know who is right and who is wrong. So I sit back, pray for peace, trust God that it will work out eventually in His plan, and go about my life. It's all I can do. Michael-D wrote: The picture of this incident in Crimea that stands out the most to me is one where an invading force has their backs turned to an armed soldier protecting his ground? The Guardian’s Shaun Walker has been given exclusive access to the inside of a Ukrainian marine base in Feodosia, Crimea, which has been surrounded by Russian troops. Inside the base at Feodosia, word came that the order had come from Kiev that all marines should give up their weapons voluntarily to the Russians. One of the marines then read on Facebook that the news was apparently fake, and rushed off to inform his superiors who were in negotiations with Russians. Many of the marines were on the phone to friends at other bases, asking whether they had been forced to give up their weapons. I am Russian myself, I was born there but we are professional soldiers and we have given an oath of duty. We will not give up this place without a fight. Jeff, have you been following what the Greek Catholic archbishop and Church have been saying? We will not be silent. The church has never covered any falsehood or violence by silence. The church always exposes lies. The church has always defended human life and human dignity. The AUCCRO is not only ready to continue this work, but we are absolutely united. At a time when our Fatherland is in danger, all kinds of interfaith disputes including property issues that may be the subject of discussion between the churches should be put aside. We now need to unite and consolidate in order to protect our people and our country. I appeal to all the faithful of the UGCC and to all the Ukrainian people. Our people and our country are currently in danger. We must stand up for our country, to be ready – if necessary – to sacrifice our lives in order to protect the sovereign, free, independent, and unified state. Grace, I don't know what the agenda, trustworthiness, cultural context, or much else of the UGCC bishops is. In the East, national and ethnic identity are STRONGLY tied into religion, in ways I don't really understand. The primary reason there's two major Ukranian Orthodox Churches is that one wants to be strongly connected to Moscow, that is, to be RUSSIAN Orthodox, and the other wants to be UKRAINIAN Orthodox. A schism over national identity. This is so far outside my understanding as to make me really wary of interpreting those statements. Michael-D wrote: I find it somewhat odd the base in Crimea wasn’t at a state of readiness. 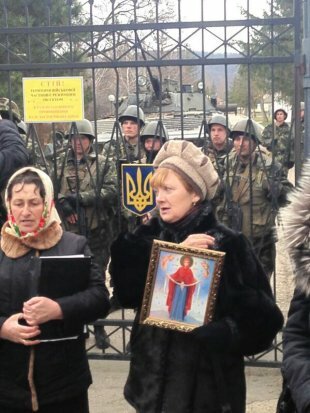 This is one of the more powerful photos .. Ukrainian women in front of the besieged Ukrainian base in Privolnoye, Crimea, surrounded by Russian military. 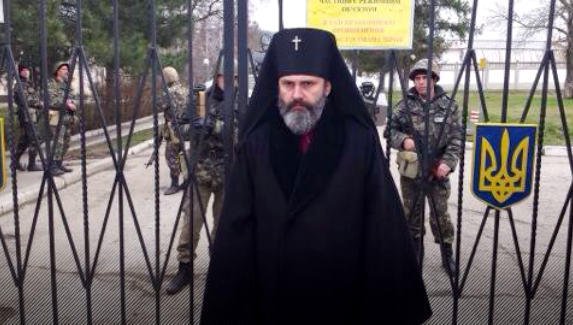 Bishop Clement, Archbishop of Simferopol and Crimea Ukrainian Orthodox Church Kiev Patriarchate, stood in the way of Russian soldiers at the gates of Ukrainian military unit. JeffStevens wrote: Here was my lament. Don't think the complaint in the middle is aimed at any of you. Jeff, your point is well made. I don't necessarily take it directed to myself. But your view is prudent and I could be FAR off base as any other outsider with limited information. I am only an amateur observer – who has taken a great interest and spent more time over the years (than I prob should have) to attempt to stay informed on the region and the geopolitical maneuvers. But I admit I am a greatly influenced by the cold war. My interest started w/ a brief military stint where learning limited information about Russian military strategy (and a few interesting encounters w/ Russians on a NATO cruise) – it did not lead me to trust the governing body of the USSR. To a certain extent, Our Lady of Fatima confirmed these suspicions. From what many perceive about Vladimir Putin….he is going to do what he can not to allow Ukraine to deepen ties w/ the EU or to join NATO. Whether it be by financial pressure or military, Russia has upper hand. As for Crimea, that Naval base in Crimea appears quite important w/ the EU ties and missile defense program going online next year in Romania (a few miles west on the Black Sea). Putin may not be in the mood to wait for long? Yet, since I have no NSA credentials -- I may be swallowing as much propaganda as the next guy. JeffStevens wrote: Grace, I don't know what the agenda, trustworthiness, cultural context, or much else of the UGCC bishops is. In the East, national and ethnic identity are STRONGLY tied into religion, in ways I don't really understand. The primary reason there's two major Ukranian Orthodox Churches is that one wants to be strongly connected to Moscow, that is, to be RUSSIAN Orthodox, and the other wants to be UKRAINIAN Orthodox. A schism over national identity. This is so far outside my understanding as to make me really wary of interpreting those statements. I understand what your saying, but to me it's clear that Putin has invaded Ukraine using protecting Russian-speakers as a pretext. I don't know how that can be spun or justified. For all sorts of reasons, maybe it would be okay with many Ukrainians if he just took Crimea, but it looks like there are events going on outside of Crimea, in Donetsk and Odessa, which may indicate he wants a lot more than just the Crimea. Not to say I think the Ukrainians are all angels. Banning Russian language was dumb and unnecessary. ...and indicative that they don't like the Russians very much. And what's the majority in Crimea? Russians. I think the analysis "Putin is a bully!" is an oversimplification. I think it's more complicated than that. He also wants to make sure a Western-oriented Ukraine doesn't turn around and just try to annex the Black Sea Fleet. The problem is, so far the actions seem to fit both "Putin is looking out for legitimate Russian interests" and "Putin is willing to risk war to ensure that Ukraine doesn't join the West." By the time we know which is which, it could be too late in the latter case. And while it's a straight up appeal to authority, which is a rhetorical and logical fallacy, the fact that Father Angel vehemently disagrees with the "Putin as aggressor" theory gives me significant pause. The Russian military has given Ukrainian forces in Crimea until 03:00 GMT to surrender or face an assault, Ukrainian defence sources have said. It's like when Mussolini demanded that Greece "let" the Italians come in and occupy their country. Or face war. It does bring back the memory of someone who invaded the Sudetenland to protect German-Speakers. The world accepted it to ensure "Peace in Our Time". This is helpful, both for the map and the info about military strength. Counter the Orange Revolution with the Red Revolution. That is simply disgraceful filth. The USA guaranteed Ukrainian freedom. Why is the US doing nothing about the Russian invasion of the Ukraine? Are you advocating war between the two largest nuclear powers in the world over Crimea? Especially when Russia denies having invaded? I'm advocatating that treaties should be honoured. What with the impending centenary of the outbreak of World War I, it’s understandable that commentators should reach back to the European crisis of 1914 for possible parallels to the European crisis of 2014. But watching the “debate” in the upper house of the Russian parliament on March 1, as the solons “considered” President Vladimir Putin’s “request” for “authorization” to deploy Russian armed forces in Ukraine, the thought occurred that the proper analogy to all this is not Sarajevo 1914, but Berlin 1935, when the German Reichstag approved the notoriously anti-Semitic Nuremberg Laws. The same dynamics were in play: blatant racism and xenophobia, a crude and violent nationalism impervious to moral scrutiny, the multiplication of lies by ranting lawmakers. Amidst the polymorphous moral confusions of postmodernity, Nazism is perhaps the one available icon of unambiguous and unadulterated evil; that iconography should not be marred by inappropriate analogizing for the sake of rhetorical effect. But the utter abandonment of reason, decency, and honesty in Moscow 2014 did seem eerily familiar. That those Russian parliamentarians, and the Putinesque “managed democracy” they embody, will not face serious internal opposition from Russian leaders who might be expected to challenge xenophobic nationalism in the name of higher truths was made painfully clear a day later. Patriarch Kirill of Moscow, the leader of Russian Orthodoxy, shares a KGB background with President Putin and leads a Church that, as a senior Catholic official once put it to me, “only knows how to be chaplain to the czar — whoever he is.” For years now, Kirill and his “foreign minister,” the youthful Metropolitan Hilarion of Volokolamsk, have been engaged in a massive campaign of seduction aimed at the Vatican, American Evangelicals, and other vibrant and influential Christian forces in the West — a campaign putatively in aid of forging a united front against decadent secularism and materialism. The true public face of the Russian Orthodox leadership, and its continued fealty to the dominant Kremlin line, were made unmistakably clear, however, when Patriarch Kirill’s spokesman, the ironically surnamed Archpriest Vsevolod Chaplin, issued a most non-comical statement urging Ukrainians not to defend themselves and their country against Russian aggression and occupation. The religious dimension of the entire Maidan movement has been sadly ignored by much of the Western media. The Independence Square chapel that was burnt down during the Yanukovych regime’s lethal assault on the Maidan last month has been rebuilt. When 30,000 people gathered on Independence Square on March 2, the day’s activities began with prayer, and as various people were making speeches to the crowd, devotees of Our Lady of Fatima were circulating through the square, passing out inexpensive rosaries. The Ukrainian Orthodox Church-Moscow Patriarchate remains divided, and its concerns tend to mute some of the public statements of the national council of churches; but there is clear anti-Putin sentiment in these quarters, which is one important factor in an appreciable increase in the ecumenical generosity and solidarity that began to surface three months ago when the Maidan movement first emerged. This is something new: Rather than being appendages of the state (the historic weakness of Orthodoxy in its interface with public life), Ukraine’s Christian communities have reoriented themselves toward civil society, which ought to help civil society build its strength for the struggles ahead. Which treaty would that be? The "treaty" most have referenced was not a treaty. seamas o dalaigh wrote: I'm advocatating that treaties should be honoured. “When we point out that this was an anti-constitutional coup, they say: ‘This wasn’t … an anti-constitutional coup, it wasn’t an armed seizure of power, it was a revolution,’” Putin said. Unfortunately, Putin may continue the Red Spring game for a few weeks? Though I doubt he'll find many romantic bolsheviks in the neighborhood. Sooner or later I'll bet he'll agree to just settle for Sevastopol. Budapest Memorandum does not obligate the US to anything but to honor Ukrainian border sovereignty and seek UNSC action if anyone nukes Ukraine. So which treaty are you referring to? What does reaffirming "commitment to Ukraine" mean? What does respecting "the Independence and Sovereignty and the existing borders of Ukraine" mean? About as much as "If you like your doctor, you can keep your doctor." I believe it means "not invading Ukraine". Which the Russians have failed to do. If the obligation was more than to "seek UNSC action", would it not have been spelled out? Pro-Russian troops have fired warning shots in the air over Ukrainian troops attempting to negotiate their return to Belbek airfield in the Ukrainian territory of the Crimea. JeffStevens wrote: I believe it means "not invading Ukraine". 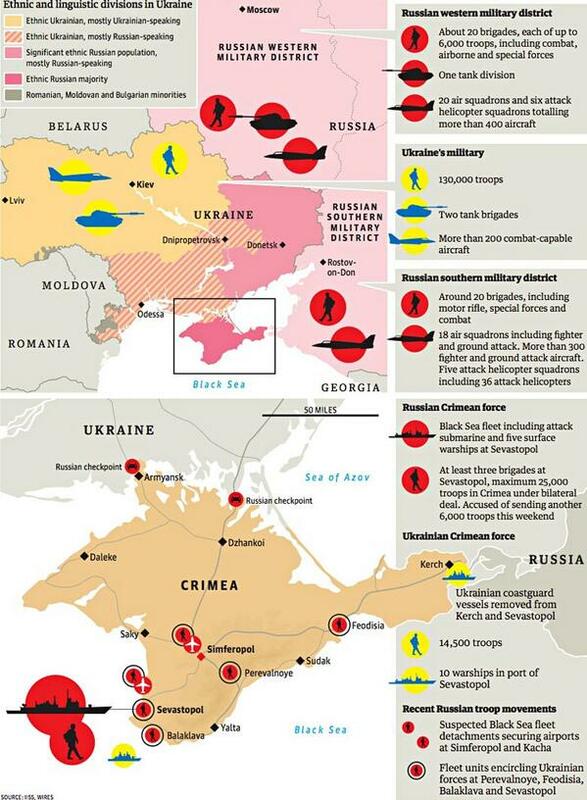 Of course the Russians have invaded Ukraine! Crimea is part of Ukraine. If Mexico used military forces to take over the southern part of California --- maybe at the request of some Hispanic mayors-- would you consider that not an invasion? Of course it's an invasion. Maybe you think it can be justified, but that is another question. But, no, I am not advocating for the U.S. to go to war over this. The Europeans need to step up, IMO. Right. I said the Russians failed to not invade Ukraine. Maybe Europe does need to step up. But that has nothing to do with the Budapest Memorandum, since only one Western European power signed it. JeffStevens wrote: Right. I said the Russians failed to not invade Ukraine. Sorry. I did pause over that and wonder, before I thought I figured out what you meant. But, no, I am not advocating for the U.S. to go to war over this. Oh, it needn't come to that. The Russians will back off as soon as America mobilises. The Australian Government is considering boycotting the Sochi Paralympic Winter Games in Russia due to the developing crisis in Crimea. The United Nations special envoy to Crimea has been forced to abandon his mission to the tense region after he was threatened by pro-Russian gunmen and later heckled by protesters. It wasn't hard to anticipate Russia's invasion of Ukraine. We knew it was possible given the invasion by Russian troops of Georgia in 2008. We knew Russia could rely on some Crimean residents to say they needed protection from Ukrainian nationalists now in power, when they were not, in fact, at risk. We knew that Sevastopol was important for Russia, serving as the country's principal warm weather port for its navy. We should have expected that Russia would do anything to defend it. We should have expected they would go beyond the minimum and occupy the whole of the Crimean peninsula. We should have anticipated, and prevented, Russia's invasion of Ukraine. That was a major failure of intelligence and diplomacy. While many now fault Europe and the US for failing to prevent the Russian invasion of Ukraine, the challenge now is how to resolve this and facilitate Russia's withdrawal. In short, we must challenge Russia to save Ukraine. Recognize Putin's criminal invasion of Ukraine and label it for what it is. If that had been the starting point 10 days ago, we might not be at such a loss for what to do today. This statement was provided to Aid to the Church in Need. It is by (Catholic) Bishop Jacek Pyl of Odessa-Simferopol. ...we must remember that trust toward a restored authority cannot be blind and should usher in an active sharing of responsibility for that which happens on our country. This shared responsibility must emanate from each of us: with responsibility for our own household, our village or city, and for our country - remembering that every citizen must not demand of oneself any less then he/she would demand of others. The insistent reminder about this responsibility will be the sacrifice of those innocent people killed – whose memory no one dare stain by their own selfish purpose or political conduct. I heard today that the Crimean legislature voted to leave the Ukraine and affiliate with Russia. They also said that they plan to have a referendum on the matter. The Euromaidan (Ukrainian: Євромайдан, Yevromaidan, literally "Eurosquare") is a wave of ongoing demonstrations, civil unrest and revolution in Ukraine, which began on the night of 21 November 2013 with public protests demanding closer European integration. The scope of the protests expanded, with many calls for the resignation of President Viktor Yanukovych and his government. Many protesters joined because of the violent dispersal of protesters on 30 November and "a will to change life in Ukraine". By 25 January 2014, the protests had been fueled by the perception of widespread government corruption, abuse of power, and violation of human rights in Ukraine. Unrest stemming from the Euromaidan protests and subsequent, violent government response has prompted fears of civil war. A turning point came in late-February, when enough members of the president's party fled or defected that they lost their majority in the Ukrainian parliament. This gave the opposition a majority, and eventually one large enough for a quorum. This allowed parliament to pass a series of laws that removed police from Kiev, canceled anti-protest operations, restored the 2004 constitution, freed political detainees, and impeached the president. Yanukovych then fled to Ukraine's second largest city of Kharkiv, refusing to recognise the parliament's decisions. The parliament has assigned early elections for May 2014. The 2014 Ukrainian revolution began with a series of violent episodes of civil unrest in Kiev, Ukraine, as part of Ukraine's ongoing Euromaidan protest movement against the government. The conflict escalated rapidly, leading to the downfall of the government of President Viktor Yanukovych and the setting up of a new government to replace it within a few days. Yanukovych fled to Russia, and is wanted in Ukraine for the killing of protesters. The conflict continued with the 2014 Crimean crisis when Pro-Russian forces seized control of the Crimea region. The 2014 Crimean crisis began in the aftermath of the 2014 Ukrainian revolution and is centered on the Ukrainian peninsula of Crimea, of which half the population are ethnic Russians. In February 2014, a pro-Russian national government was replaced with one desiring closer ties to the European Union. As tensions rose between the pro-European Euromaidan and pro-Russia anti-maidan popular movements, Russian troops seized control of the peninsula. The West has a moral duty to support the Maidan and the new Ukrainian government. Russia's criminal invasion must be stopped.